We've been qualified and working together for 6 months now and I can't believe how quickly time has flown by. Tami has been a tremendous lifeline to me; not only being my eyes and my mobility aid, but also my best friend. We've been all around Manchester and beyond and I couldn't imagine not having her by my side! 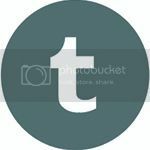 You can learn more about my matching and training process with Tami, both residential and domiciliary, by reading my blog posts here. I also created a series of audio diaries to document our daily training that you can listen to here. Tami and I will be due our 6 month review very soon and I'll be sure to share with you how we get on! In this month's visit with the Art Galleries and Museums group, comprised of service users within the community services and social groups from Henshaws, we visited Gallery Oldham for an audio described talk and tour of their Season's Best exhibition. This charming collection combines elements of art, social history and natural history to tell the story of the seasons during the ever-turning wheel of the year. Curator Sean Baggeley presented our talk, detailing certain pieces from each season, with audio description provided by the wonderful Anne Hornsby of Mind's Eye Description Services. All four seasons are depicted around the exhibition space, with a cross-shaped wall in the centre of the room helping to divide the seasons. This also creates a backdrop and splash of colour that gives a simple visual representation of that particular season; cream for Spring, yellow for Summer, orange for Autumn and silvery off-white for Winter. Explorer bags are hung at the entrance, for those wishing to partake in an interactive experience, complete with magnifiers and colouring books! "March comes in like a lion and goes out like a lamb"
We start the journey at Spring, which incorporates a palette of earthy tones. A selection of flowers, including daffodils and daisies, leaves, bird nests, frogs and stuffed rabbits showcase the new growth and new beginnings of the natural world during this time. Whit Walk banners adorn the walls, one from Saint Ambrose School and the other of Failsworth Methodist Sunday School, and these were described to the group in great detail with a postcard of the Saint Ambrose banner being passed around for those with some remaining vision; helping us to appreciate just how intricate the stitching truly is. 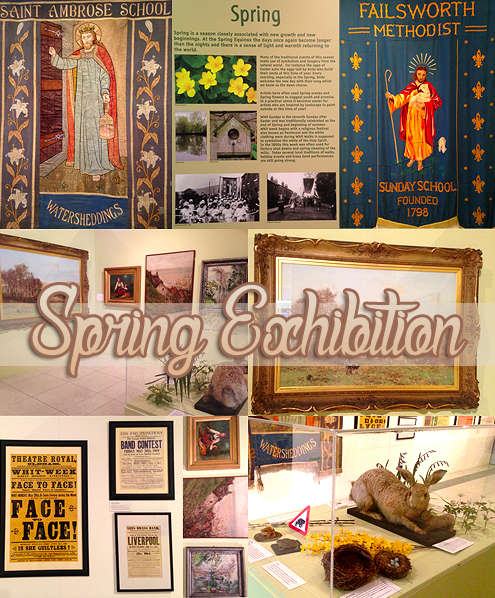 Various posters depict Springtime events, including brass band performances, and framed landscapes tell the story of blooming plants and an awakening scenery. The Dawn Chorus provides a multi-sensory element, with large Spring-related quotes emblazened between the framed pieces. 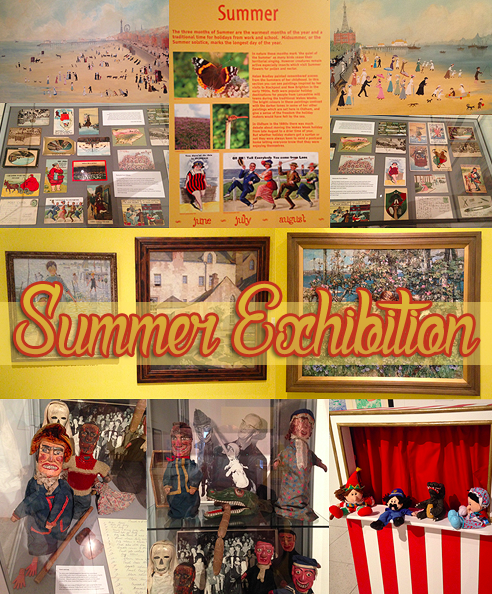 "A dripping June sets all in tune"
Summer provides a bright pop of yellow to the next exhibits; where Punch and Judy is the main attraction! Original puppets and written script directions are displayed, alongside a modern remake of the classic striped booth containing newer, softer puppets for visitors to create their own live-action show! Postcards that were sent to and from Blackpool to Oldham are presented in their own display case, and an enlarged photocopy was passed around the group of, one in particular, of a sunbathing lady declaring that you "daren't do this in Oldham!" For those using the explorer bags, a postbox can be spotted in this area presenting the opportunity to decorate and send off your own summer postcard - a really nice touch, I thought! The paintings in this area mainly focus on people during summer, rather than the landscape itself as previously seen in the Spring area. Two Helen Bradley paintings in particular, "New Brighton" and "A Summer Afternoon on the Sands of Blackpool", were audio described detailing the colours, imagery and recurring characters often seen in Bradley's works - such as Miss Carter wearing pink, as always! Posters advertise discounted trips away, raft races, horse shows, circus events, and a flower and vegetable show with large, colourful lettering and lined illustrations. 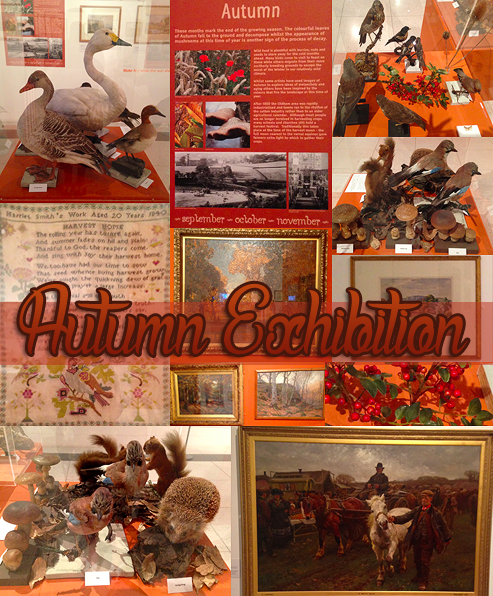 "Autumn; the year's last, loveliest smile"
"A season of mists and mellow fruitfulness"
Autumn provides a more reddish burnt-orange tone on the feature wall, and a visual movie display captures falling Maple Seeds whirling like little helicopters! Stuffed Swans, Geese, Jays, Moths, Bees, Squirrels and Hedgehogs alongside a cornucopia of berries, leaves and mushrooms canvas nature's inhabitants during this season. "White Slave" by James Richardson was audio described to the group recounting a brown, muddy palette and market scene of a beautiful white horse being sold. A hand-stitched sampler by Harriet Smith, from 1840, integrates the themes of religious poetry and of harvest festival. Various framed artworks return to landscaped sceneries, depicting the turning of the leaves to the beautiful array of oranges, reds and browns we witness in the Autumn months. 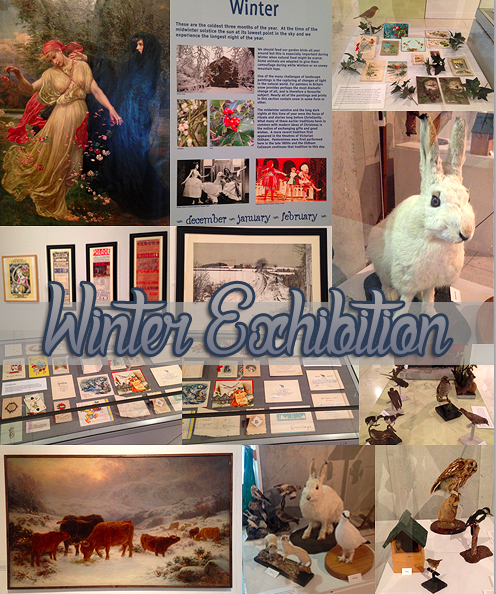 "Frost on the shortest day bodes a bad winter"
"If February gives much snow a fine summer it doth foreshow"
The group reseated in the Winter area to end the exhibition and the annual year. In this area a selection of Christmas cards fill a glass display case, rather than holiday postcards, to reflect the history of wishing a happy holiday to friends and loved ones; with both vintage and modern designs. As the season of the Pantomime, varying posters of Cinderella productions were described to us. Stuffed animals such as Weasels and Hares, birds including Robins and Owls and Holly and Ivy paint the season of Winter perfectly. 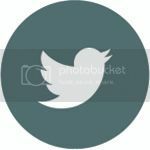 Information on bird migration and how to help feed birds effectively during the Winter months is also provided. "The First Touch of Winter, Summer Fades Away", an oil on canvas by Valentine Prinsep, painted in 1897 in a Pre-Raphaelite style prevalent of that time, was the audio described art work from this area. Two women represent Summer and Winter, respectively, with Winter touching Summer resulting in her death as petals fall and the trees darken. Again, a postcard was provided and handed around to the group for those who could pick out the details to appreciate this beautiful piece. After the audio described talk and tour had finished, there was a touch and handling element of Summer items to conclude our visit. Various shells that the Curator had collected, puppets from Punch and Judy complete with well-used sausages from the 1960's productions, and a horn from a 1920's ice cream truck that used to visit Oldham and the surrounding markets were passed around the group. Season's Best has cemented its place as one of my favourite exhibitions, along with Something Blue: Wedding Fashions 1914 - 2014, that I've had the pleasure of exploring with the group so far. The aforementioned touching and handling session was something I thoroughly appreciated and enjoyed, and the added sensory element of the Dawn chorus was also a nice touch! Thank you to Mary Gifford, Anne Hornsby, Sean Baggeley and Mary Tantrum for a truly enchanting and splendid visit to Gallery Oldham! 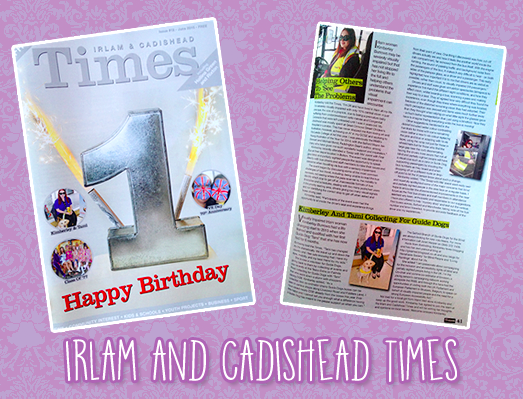 My local community magazine, the Irlam & Cadishead Times, celebrates its first birthday this month! To celebrate, a special bumper issue is currently being delivered to thousands of homes in the area. 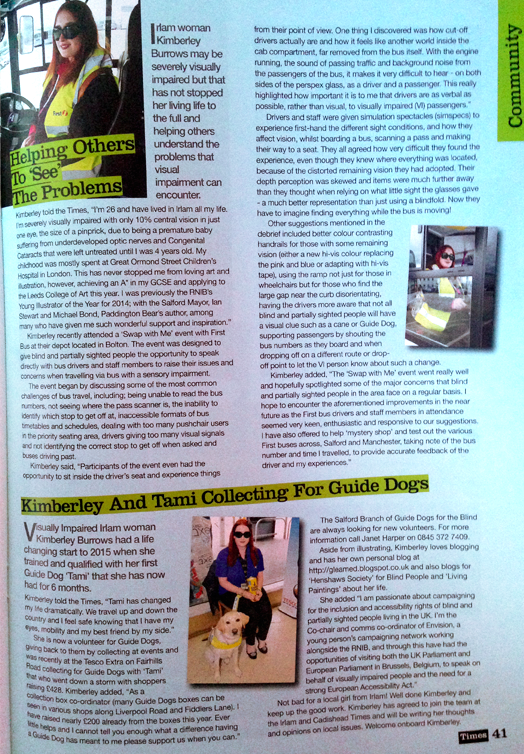 As well as being featured on the front cover, inside the magazine this month is a full-page spread incorporating two articles based on recent events I have taken part in; the 'Swap With Me' event with First Bus and a collection event at my local Tesco supermarket for Guide Dogs! Irlam woman Kimberley Burrows may be severely visually impaired but that has not stopped her from living life to the full and helping others understand the problems that visual impairment can encounter. Kimberley told the Times, "I'm 26 and have lived in Irlam all my life. I'm severely visually impaired with only 10% central vision in just one eye, the size of a pinprick, due to being a premature baby suffering from underdeveloped optic nerves and Congenital Cataracts that were left untreated until I was 4 years old. My childhood was mostly spent at Great Ormond Street Children's Hospital in London. This has never stopped me from loving art and illustration, however, achieving an A* in my GCSE and applying to the Leeds College of Art this year. I was previously the RNIB's Young Illustrator of the Year for 2014; with the Salford Mayor, Ian Stewart, and Michael Bond, Paddington Bear's author, among many who have given me such wonderful support and inspiration." Kimberley recently attended a 'Swap With Me' event with First Bus at their depot located in Bolton. The event was designed to give blind and partially sighted people the opportunity to speak directly with bus drivers and staff members to raise their issues and concerns when travelling via bus with a sensory impairment. The event began by discussing some of the most common challenges of bus travel, including; being unable to read the bus numbers, not seeing where the pass scanner is, the inability to identify which stop to get off at, inaccessible formats of bus timetables and schedules, dealing with too many pushchair users in the priority seating area, drivers giving too many visual signals and not identifying the correct stop to get off at when asked, and buses driving past. Kimberley said, "Participants of the event even had the opportunity to sit inside the driver's seat and experience things from their point of view. One thing I discovered was how cut off drivers actually are and how it feels like another world inside the cab compartment, far removed from the bus itself. With the engine running, the sound of passing traffic and background noise from the passengers of the bus, it makes it very difficult to hear - on both sides of the perspex glass - as a driver and passenger. This really highlighted how important it is to me that drivers are as verbal as possible, rather than visual, to visually impaired (VI) passengers." Drivers and staff were given simulation spectacles (Sim Specs) to experience first-hand the different sight conditions, and how they affect vision whilst boarding a bus, scanning a pass and making their way to a seat. They all agreed how very difficult they found the experience even though they knew where everything was located, because of the distorted remaining vision they had adopted. Their depth perception was skewed and items were much further away than they thought when relying on what little sight the glasses gave - a much better representation than just using a blindfold. Now they have to imagine finding everything while the bus is moving! Other suggestions mentioned included in the debrief included better colour-contrasting handrails for those with some remaining vision (either a new hi-vis colour replacing the pink and blue, or adapting with hi-vis tape), using the ramp not just for those with wheelchairs but for those who find the large gap near the kerb disorientating, having the drivers more aware that not all blind and partially sighted people will have a visual clue such as a cane or a Guide Dog, supporting passengers by shouting the bus numbers as they board and when dropping off on a different route, or drop-off point, to let the VI person know about such a change. Kimberley added, "The 'Swap With Me' event went really well and hopefully spotlighted some of the major concerns that blind and partially sighted people in the area face on a regular basis. I hope to encounter the aforementioned improvements in the near future as the First bus drivers and staff members in attendance seemed very keen, enthusiastic and responsive to our suggestions. I have also offered to help 'mystery shop' and test out the various First buses across Salford and Manchester, taking note of the bus number and time I travelled, to provide accurate feedback of the driver and my experiences." 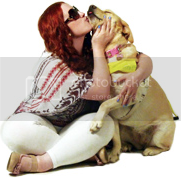 Visually Impaired Irlam woman Kimberley Burrows had a life changing start to 2015 when she trained and qualified with her first Guide Dog, Tami, who she has now had for 6 months. Kimberley told the Times, "Tami had changed my life dramatically! We travel up and down the country and I feel safe knowing that I have eyes, mobility and my best friend by my side." She is now a volunteer for Guide Dogs, giving back to them by collecting at events and was recently at the Tesco Extra on Fairhills Road collecting for Guide Dogs with Tami that went down a storm with shoppers raising £428! Kimberley added, "As a collection box co-ordinator (many boxes can be seen in various shops along Liverpool Road and Fiddlers Lane), I have raised nearly £200 already from the boxes this year. Every little helps and I cannot tell you enough what a difference having a Guide Dog has meant to me. Please support when you can!" 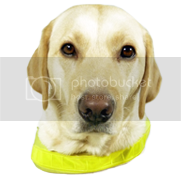 The Salford Branch of Guide Dogs for the Blind Association are always looking for new volunteers. For more information call Janet Harper on 0845 372 7409. Aside from illustrating Kimberley loves blogging and has her own personal blog at gleamed.blogspot.co.uk and also blogs for Henshaws Society for Blind People and Living Paintings about her life. She added, "I am passionate about campaigning for the inclusion and accessibility rights of blind and partially sighted people living in the UK. I'm the Co-chair and comms co-ordinator of Envision, a young person's campaigning network working alongside the RNIB, and through this have had the fantastic opportunities of visiting both the UK Parliament and European Parliament in Brussels, Belgium, to speak on behalf of visually impaired people and the need for a strong European Accessibility Act." Not bad for a local girl from Irlam! Well done Kimberley and keep up the good work. Kimberley has agreed to join the team at the Irlam and Cadishead Times and will be writing her thoughts and opinions on local issues. Welcome onboard Kimberley! As mentioned in the second article, I am now a columnist for the Irlam and Cadishead Times! I look forward to writing about local issues and sharing the things I get up to with local readers! I would like to wish the Times a very Happy 1st Birthday! 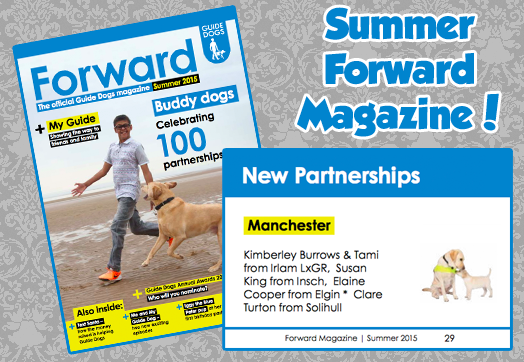 The 12th issue for June 2015 is available now on doorsteps across Irlam, Cadishead, Hollins Green and Rixton! 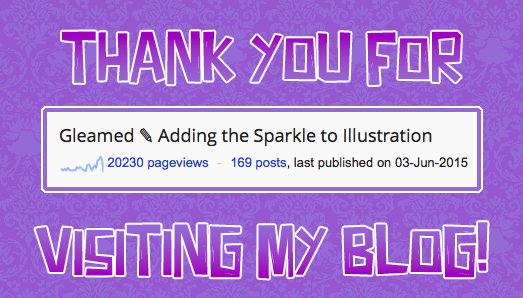 I have now reached over 20,000 unique page views on my blog! 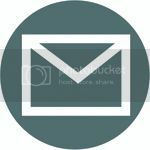 When I first created my blog, back in October 2013, I never imagined it would be as popular as it has become; with entries amassing hundreds of views at a time. I want to take this opportunity to say a huge thank you to my readership, new and old, who have helped me to achieve this milestone. I'm extremely grateful for your support! 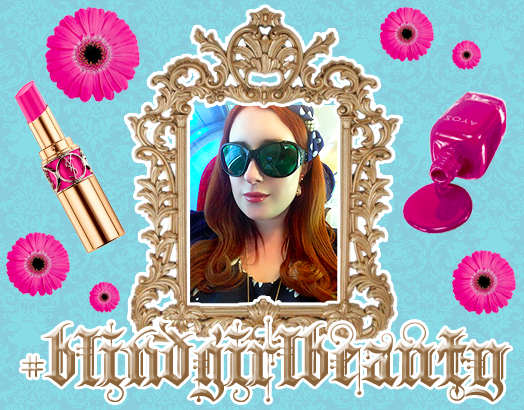 Welcome to the #blindgirlbeauty tag! 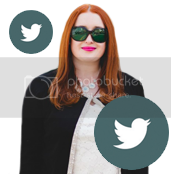 I was nominated by Emily Davison of fashioneyesta, who teamed up with VI blogger and YouTuber Molly Burke, to share tips and tricks for applying make-up, piecing outfits together, selecting accessories and generally defying the stereotypes of what people think a blind person should look like. You are more than welcome to take part too! Simply use the hashtag #blindgirlbeauty, share on your social media accounts and nominate your friends! person who is blind or visually impaired? For me, the hardest product to apply is lipstick; especially when it's well used and no longer holds its original pointed shape. Throughout the process of application I worry about getting it all over and completely missing the outline of my lips, so end up taking such a long time with it. To aid me, I'll either use my hand as a barrier against the edges of my lips or apply in small amounts to the middle of my lips and then use my fingers to blend it out. A sighted pair of eyes is always needed to ensure it looks clean, well-defined and as natural as possible! I much prefer to use a lipgloss from a squeezy tube so that I have control over the amount I'm using and its distribution as I'm spreading it. What is your number one tip for shopping with vision loss? Take your time, enjoy yourself and don't feel pressured into buying anything that doesn't feel right to you. Shop with a best friend or close family member for the best results or ask a shop assistant if you need an opinion on what looks best from a sighted perspective - though do follow your own initiative as well. Something may look good on you in someone else's eyes, but if you feel it's not really representative of "you" and you don't feel comfortable then take that into consideration as well. I enjoy shopping online, reading the various descriptions of cosmetics, clothing and accessories with the VoiceOver functionality built-in to my MacBook, so don't always feel you that have to endure the hustle and bustle of going into a busy store in order to purchase what you want. It can be done at home instead and the excitement comes with the waiting! What is the one beauty item you stay away from due to vision loss? Tanning products! They are so easy to get wrong, either by applying too much or accidentally creating a streaky / patchy look, so I tend to stay away completely. As someone with naturally auburn hair (though enhanced professionally to create a more noticeable look), therefore having a very fair and freckled complexion, I embrace my paleness instead and avoid being pressured into feeling like I have to be spray-tanned in order to feel beautiful showing my skin in the summer months. I'm pale and proud! As I also mentioned I have my hair coloured professionally. I avoid boxed dyes as I wouldn't have the first clue as to whether I've applied the dye evenly to my roots and throughout the rest of my hair, and I don't trust that it will be healthy enough for my dry and thick locks. Not to mention the mess I would most certainly make in the bathroom! I feel much more comfortable consulting a professional who has seen my natural reddsih-brown shade, knows how I want it to look (Florence Welch and Merida from Brave were the main inspirations behind taking my shade to the next level in early 2012!) and do so in the correct way that is safe and nourishing to my hair. with vision loss who wants to get into makeup? Experiment and have fun. You will learn from your mistakes and get better with practice. Get used to the shape of your face and where your features are, and stick to shades that best match your complexion and skin tone. Invest in good-quality cosmetics, brushes and accessories for the best results when you feel you have mastered the basics. If you are severely visually impaired like myself, or blind, and don't have enough useful vision - use a handheld Braille labeller or RNIB PenFriend to label your products, listing their shades, so that you can identify your cosmetics and create different looks independently without needing the assistance of a sighted person. someone who is blind or visually impaired? I first discovered make-up when I was 14 years old and I still remember the first products I ever bought. I used cheaper brands to start with while I was still learning the application process and getting familiar with the shape of my face, eventually investing in higher-quality cosmetics, that don't test on animals, as I got better and started to enjoy putting my make-up on without sight. Practice makes perfect, so rest assured I made a lot of mistakes to begin with! should be able to do without looking? Mascara and blush are by far the easiest products to apply - so everyone should be able to do these two without looking in the mirror. Applying mascara may sound daunting to someone with a visual impairment but once you get the hang of it it can be a very quick process. Simply tilt your head back so that the wand, or mascara's brush, catches your lashes - rather than poking out your eye! - and wiggle whilst applying to evenly distribute the product through. To finish, I tend to run my finger over my lashes just to catch any excess product and prevent it from clumping. Blush, or a bronzer if you prefer, is also an easy task. Find the bottom of your ear lobe and use this as a guide of where to apply on the apples of your cheeks. Sweep lightly from the direction of your ears to start with and gradually build it up for a more natural look. Absolutely not. Just because I can't see my own reflection doesn't mean I can't feel beautiful. Beauty is not a visual thing; it's how you perceive yourself to be from your character and your actions. Knowing the time and effort I have put into my appearance - through choosing my outfit, applying my make-up, and selecting matching accessories - elevates my self-confidence and sense of worth, giving me a foundation on which to start my day. Of course, this won't necessarily be the same for someone else with a visual impairment. Feeling beautiful in an individualistic thing. It's about how I feel and not how I look! Applying nail varnish. My mum still does this for me while I'm in the process of figuring out how best to do it on my own. I have tried a few methods such as adding tape around my nail as a guide, but found that it still wasn't as accurate as I would have liked it to be and was rather fiddly to do! I've also tried applying a small blob of varnish to the centre of my nail and then slowly, using circular motions, spreading it outwards - but again this hasn't been as successful as I would have liked and I still manage to paint over my nail onto the surrounding skin of my fingers. Using a corrector pen isn't always helpful as I will take varnish off from my nail if I don't aim it correctly. I will get there eventually but this is something I clearly need to practice! I think one beauty essential that every girl needs is a good lipgloss or lipstick, depending on your preference. It's the basis of a look and nourishes your lips at the same time whilst giving a pop of colour. A fashion essential is a good pair of comfortable, yet stylish, shoes and a handbag that matches and sets off your overall look. Always try to colour co-ordinate as much as possible! make-up as a person with vision loss? Feeling a sense of accomplishment at doing something so visual, independently, without relying on the aid of a mirror. Knowing that your looks from any two days will never be the same, and being unique with your perspective and approach to beauty and applying products. disasters in the past that are due to having vision loss? Of course! I previously mentioned that I remember the first ever products I bought when I first got into cosmetics; these included a lilac glitter eyeshadow, bronze blush and a baby pink lipstick - and I am squirming as I type! The colours sounded cute to me when described but as someone with a severe visual impairment I didn't quite have the sufficient vision to see just how garish they were. My choices were a disaster in themselves though it was the early 2000's, at the height of the frosted make-up trend and butterfly clips, so I think I can be forgiven for my choice in mis-matched and daring pastels! Also in the early days of my make-up use, I could never quite find an ivory foundation that matched my pale skin tone so would have to settle for whatever was available in Boots or Superdrug at the time. This was, more often than not, a slightly darker and more yellow-based foundation than what I wanted! you don't look blind / visually impaired? I did before I chose to wear UV glasses in 2008 and before I qualified with my Guide Dog in 2014; people just thought I was clumsy when I bumped into things or had sensitive eyes because they flutter and move often with my condition. I don't get it too much anymore, but still do receive a lot of comments such as "You are so pretty for a blind person" - whatever that is supposed to mean! when putting outfits together or doing your make-up? The RNIB PenFriend, Dymo Braille labeller and a Colour ID app on my iPhone are all essentials and lifesavers! I use the handheld Dymo Braille labeller to label up my cosmetics, creams, and shampoo and conditioner and the RNIB PenFriend with small labels (that I vocally record onto) to identify my make-up products, with machine-washable labels for my clothes. 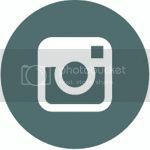 The Colour ID app on my iPhone helps me to distinguish what colour an item of clothing is, along with any colours within intricate patterns in the fabric, when I'm unsure because of varying light conditions that affect my remaining sight. 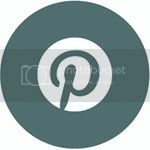 Anything else, such as choosing accessories or shoes, is identified by touch as I love tactile pieces incorporating sequins, jewels and pearls. 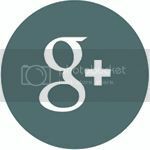 Don't forget to check out Emily's #blindgirlbeauty tag blog post and video as well as Molly's video to find out their answers to the above questions. Both ladies are fantastic for all things inclusivity and fashion!